Rated 4.5 out of 5.0 based on 305 surveys. The Grand Californian, built in the rustic stone-and-timber style of the grand national-park lodges, is the flagship property. Newer, more elaborately themed, and closer to the theme parks and Downtown Disney than the other two on-property hotels, the Grand Californian is without a doubt the best place to stay...if you can afford it. 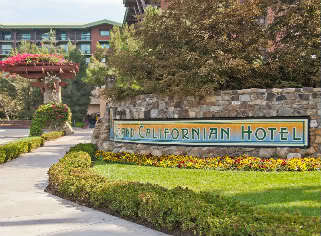 The Grand Californian hotel is the crown jewel of Disneyland Resort’s three hotels. With its shingle siding, rock foundations, cavernous hewnbeam lobby, polished hardwood floors, and cozy hearths, the hotel is a stately combination of elements from Western national park lodges. Designed by architect Peter Dominick (who also designed the Wilderness Lodge at Walt Disney World), the Grand Californian is rendered in the Arts and Crafts style of the early 20th century, with such classic features as “flying” roofs, projecting beams, massive buttresses, and an earth-tone color palette. We strongly encourage visitors with an interest in architecture to take the fascinating (and free) hour-long Art of the Craft walking tour of the resort, offered several times each week through the Guest Services desk. Most reminiscent of the Ahwahnee hotel at Yosemite National Park, the Grand Californian combines rugged craftsmanship and grand scale with functional design and intimate spaces. Pull up a vintage rocker in front of a blazing fire, and the bustling lobby instantly becomes a snug cabin. In 2018, Grand Californian's rooms received a much needed top to bottom upgrade. Lighting has been drastically improved, USB charging outlets are plentiful, the decor has been freshened up, and more storage space has been added. The hotel's main entrance off Disneyland Drive is primarily for vehicular traffic. Two pedestrian-only entrances open into Downtown Disney and DCA; this last makes it a cinch to return to the hotel from DCA for a nap, a swim, or lunch. Walking time to Disneyland Park is about 4 minutes. MouseSavers.com has a list of discounts and deals available at Disney's Grand Californian Hotel. Ranging $475–$980 per night, guest rooms are the most expensive at Disneyland Resort. The Grand Californian, like the other two Disney-owned hotels, charges guests $20 a day for self-parking (up to two vehicles, free for Disney Vacation Club members) or $30 for valet (714-635-2300). On the plus side, none of the hotels charge a resort fee, and all provide safes, mini-fridges, coffeemakers, and free Wi-Fi in rooms and public areas. Disney’s time-share condo enterprise, the Disney Vacation Club, premiered its first West Coast property as part of the 2009 expansion of the Grand Californian. The Villas at Disney’s Grand Californian consist of 48 two- bedroom equivalent villas and two Grand Villas. Equivalent is the term used to describe single units that can be sold (or rented) as studio suites or combined to make two- and three-bedroom villas. All villas except studio suites include kitchens, living rooms, and dining areas, as well as washers and dryers. Master bedrooms offer a king bed, while other bedrooms provide two queen beds. Studio suites come with a single queen bed. All bedrooms have a flat-panel TV, private bath, and private balcony. Though studio suites don’t have full kitchens, they do include a small fridge, a microwave, and a coffeemaker. Two-bedroom villas consist of a one-bedroom villa joined to a studio suite. Three-bedroom Grand Villas are two-story affairs with the living area, kitchen, and master bedroom on the lower level and two bedrooms on the upper level. Rates for various villas range from $400 for a studio suite during the off-season to $6,000 for a three-bedroom Grand Villa on New Year’s weekend. Other elements of the Grand Californian include a swimming pool for the villas and an underground parking garage. Inspired by Napa Valley cuisine, the Napa Rose restaurant is the Disneyland Resort's premier fine-dining venue. Situated in a stunning room overlooking DCA, Napa Rose is very expensive but still a very good value . Just a notch down in price and formality, but likewise located in an exceptionally lovely (albeit more rustic) room, is the Storytellers Cafe, which serves breakfast, lunch, and dinner. The restaurant's name is drawn from period murals depicting tall tales set in early California. The fare consists of house-specialty wood-fired pizza and hearty home-style comfort food. The resort's pool complex, beautifully landscaped with rocks and conifers in a High Sierra theme, includes a 90-foot-long twisting slide. The on-site Mandara Spa is one of Disney's best, offering a wide selection of treatments and a state-of-the-art fitness facility. Each Disney-owned hotel has a nice theme but Grand Californian's theme national-park lodge theme is unmatched in terms of beauty and scope. Yes, you will pay a high premium to stay here but having a direct entrance in to Disney California Adventure is a nice perk. Also, Grand Californian has some of the best dining available in Disneyland Resort. A security gate guards the entrance to Disney's Grand Californian Hotel's grounds. If you arrive by car, you'll need to provide photo ID at the gate; it's not necessary to provide your reservation number or paperwork. A dedicated parking lot across from the lobby serves as temporary parking for those who need it while checking in. Check-in time at Grand Californian Hotel is 3:00 PM, and check-out time is 11:00 AM. You'll need to provide a government-issued photo ID and credit/debit card when you register. Grand Californian rooms include excellent light for reading in bed, more than adequate storage space, a two-sink vanity outside the toilet and bath, and, in some rooms, a balcony. Views from the guest rooms overlook the swimming pool, Downtown Disney, or Disney California Adventure theme park. A standard Grand Californian room with two queen beds. A ton of USB wall sockets. Seriously, they're everywhere. The mini-fridge is a dorm-style unit that sits under a counter or desk. It's more like a beverage chiller than a refrigerator in that it'll keep drinks cool, but you're not going to freeze popsicles or make ice cubes in it. Every room in Grand Californian Hotel has a coffee maker. (Left)Dresser, TV, and small table with a chair. (Right)Coffee maker, and closet area. (Left)Each room comes with two sinks in the bathroom. (Right)Toilet and shower. This room is separated from the sink area by a sliding door. 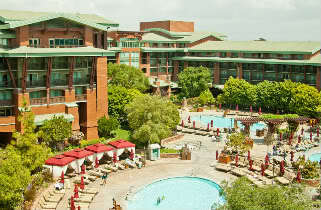 Grand Californian Hotel has rooms available with various accessibility options. Some feature roll-in showers, while others include assistive hearing devices. Disney knows that some hotel rooms are better than others. Most people prefer to be close to the lobby and dining, and want something pretty to look at from their hotel room window. To capitalize on this, Disney categorizes all of Grand Californian Hotel's rooms based on what you see from inside the room. A Standard View room may look out on to a parking lot, pools, or landscaping. Woods-Courtyard View rooms look out on to a usually peaceful courtyard. Deluxe Partial View rooms have partial views of DCA, or Downtown Disney, but may also look on to courtyards or trees. Downtown Disney View rooms are upper level rooms that have views of Downtown Disney. These rooms do have nice views, but that may come at higher than usual noise levels. Premium View rooms feature views of Disney California Adventure theme park. The higher your room is, the better your view of the DCA will be, but that privilege does come at a higher price (sometimes as much as $150 or more, per a night). Grand Californian Hotel's Fountain Pool, Redwood Pool, and Mariposa Pool range in depth from around 3 feet 6 inches/1.1m to 4 feet 9 inches/1.4m. Grand Californian Hotel's pools are open every day, including during winter. Pools are heated to 82°F/28°C throughout the year. We've swum in temperatures as cold as 40°F/4°C; the water was fine, but getting out was a shock. Grand Californian Hotel also has a hot tub near each pool. The Redwood Pool also features a waterslide. Grand Californian Hotel's Fountain Pool and Redwood Pool each have a chair-lift device that can lower guests in wheelchairs into the shallow end of the pool. Check with any lifeguard for assistance on using the lift. Grand Californian Hotel has one full-service restaurant, one character dining restaurant, two bars and lounges, and two counter service restaurants. If none of these establishments meet your needs you can take a short walk to Downtown Disney and eat at any one of its restaurants of varying quality and price range. Napa Rose is Disneyland resort's flagship fine-dining experience. The Grand Californian's Craftsman theme is carried into this premier room with sweeping views of Disney California adventure from virtually every table. A large, open demonstration kitchen lets you watch the magic happen, and wine, in all of its glory, is displayed at every turn. Fine linens, china, and flatware are the norm. This is an absolutely gorgeous room with food and service to match. Napa Rose may be the best restaurant in Orange County and has been at the top of most critics' lists since its debut. Top talent in the kitchen and in the dining room, beautiful space with panoramic views and a wine cellar second to none, make this an incomparable gustatory experience. Every server has earned sommelier status, a designation that takes years of study and practical experience with wine and wine-making. Look for unusual ingredients (tahitian vanilla, smoked sturgeon, truffled quail eggs, lemongrass, almond oil) married to top-notch staples (Colorado lamb, Berkshire pork, pheasant breast), all deftly handled by a world-class kitchen crew. and although staff are very accommodating in the usual Disney manner, this is definitely not an adventure for the kids. Napa Rose should be on every adult's Disney bucket list, a must-do at least once. If the full menu is too rich for your blood sit in the cozy lounge and order appetizers. The menu, rotated seasonally, focuses on the cuisine of California's wine region, ranchlands, farm belts, and coastline. Wine finds its way onto most of the menu in sauces, reductions, infusions, and dressings. Napa Rose also has an attached lounge with a variety of fancy cocktails and wine. Napa Rose Lounge has its own menu but guests can also order off of the main Napa Rose menu. The Storytellers Cafe carries the grand Californian's arts and Crafts theme throughout with large, open beams; natural wood and wood carvings; milled stone; and stained glass. the walls are adorned with impressive murals depicting the state's rich literary history, from Mark twain's the Celebrated Jumping Frog of Calaveras County to Scott Dell's Island of the Blue Dolphins. You may experience a little sticker shock at first, but there's real value here. It's not quite on par with Napa Rose across the way, but the same dedication to quality and originality is evident in everything from the menu to the service. Kids will find lots to like about the menu, along with enough distractions between the colorful menus, murals, and character visits to let the adults enjoy a wide range of menu options (from pastas to steaks to fresh fish) and a leisurely cocktail or glass of wine. You'll want to save some room for dessert, too who could pass up warm seasonal-fruit cobbler heaped with vanilla ice cream or a warm chocolate brownie? Children under age 10 will love the character breakfast. Chip & Dale, goofy, and other Disney celebrities visit the tables, sign autographs, and pose for photos between bites of omelets, waffles, and hotcakes. At dinner, braised chicken and lemon prawns. White Water Snacks is a great place to eat. It has lots of choices to make everyone happy and is easy to get to when you need a break from the parks. White Water is a bit off the beaten path, because of this it rarely seems to be crowded. We’ve been on the most packed of summer days and found the whole place fairly deserted. Yet, White Water Snacks is so close you can see DCA right through the windows. Hearthstone Lounge is Grand Californian's main lounge. Located just off of the hotel's lobby, Hearthstone has indoor seating and a full drink menu with several beer selections, wines, and a selection of spirits. Driving Your Own Car Grand Californian Hotel is just off of the 5 freeway in Anaheim. Take I-5 South Exit on Disneyland Drive and turn left on Disneyland Drive. Go about 0.6 miles and Grand Californian Hotel will be on your left. From Los Angeles International Airport or John Wayne Airport If you're arriving at LAX or John Wayne, Gray Line Anaheim's Disneyland Express will take you and your luggage directly from the airport to Grand Californian Hotel, then back to the airport when it's time for your flight home. This service is not free and reservations must be made in advance. Prices from LAX are $30 one way/$48 roundtrip for adults, and $22 one way/$36 roundtrip for children. Prices for John Wayne Airport are $20 one way/$35 roundtrip for adults and $15 one way/$26 roundtrip for children. See Gray Line's website for more information. Another transportation option is SuperShuttle. Prices are $16 per person one way/$32 per person roundtrip from LAX and $10 per person one way/$20 per person roundtrip from John Wayne Airport. These prices do not include tip. Getting to the theme parks and Downtown Disney: All Disneyland Resort theme parks, hotels, and Downtown Disney can be accessed with a short walk from any Grand Californian Hotel room. The walk from Disneyland Hotel to Disneyland or Disney California Adventure usually takes about 15 minutes, depending on how fast you walk. Another option is to take the Disneyland Monorail. Guests who catch the monorail at Downtown Disney will be dropped off at the Tomorrowland Monorail Station. Grand Californian Hotel's gift shop is Acorns Gifts & Goods and sits just off the lobby. As you'd expect from a Disney gift shop, Acorns has a decent collection of souvenirs ranging from small trinkets such as keychains and pens, to embroidered jackets and Disney princess dresses. Prices for these items are about what you'd pay in the theme parks or Downtown Disney. Acorns also sells basic pharmacy items such as sunscreen, aspirin, allergy and cold medicine, baby diapers and formula, shampoo, and the like. Disney-branded cookies, chocolate, coffee tins, and similar items are also available. Prices for these items are considerably higher - about double - than what you'd probably pay at home. Coin-operated washers and dryers are in laundry facilities located near the Fountain Pool. Cost is around $2 per wash, and another $2 per dry cycle. The machines take quarters, and a change machine is provided. A small selection of soap, fabric softener, and dryer sheets are also sold, for around $1 each. A typical wash cycle takes 20 to 30 minutes, and a typical dry cycle takes 40 to 50. If you lose something during your stay, contact Grand Californian Hotel's Lost and Found department by calling (714) 635-2300. Rated 4.5 out of 5.0 based on 305 reader ratings.